I started using Evernote® in 2009, mainly for notes and web clips. I didn’t know how powerful it was or that one day I would be using it for everything. By “everything” I mean I use it all day long, in all aspects of my work and personal life. I use it to store all of my notes and documents. I use it for research and writing. I use it for marketing. And I use it to manage all of my projects and tasks. Evernote is my filing cabinet and my personal assistant. . . .if you took away every piece of software I own and left me with Evernote (and an Internet browser) I could run my two businesses, blogs, and personal life without missing a beat. In this book, I’ll show you how I do that and how you can, too. Attorneys manage an incredible amount of information. We need to be able to collect it, process it, store it, and find it, and this is where Evernote excels. But it’s not just about notes. You can store documents, audios, and images. You can save legal opinions, interviews and witness statements, reports and articles, photos and slide presentations, spread sheets and pdfs. And everything is synced so you have everything, everywhere: on your desktop, on your mobile device, and anywhere there is an Internet connection. Imagine being in court or in a meeting and needing a key piece of information or a document you forget to bring. Open your laptop, tablet or smart phone and there it is. Or you start working on a motion at the office, dictate your declaration in the car or on the train, and finish it at home without ever having to print. Or, you’re trying to locate a document expert you saw testify once but you can’t remember his name. You search Evernote for “questioned document” and in seconds, find his name, contact information and his CV you forgot he sent you. As more attorneys use cloud-based applications to manage their work, the once fanciful notion of a paperless office is becoming a reality. 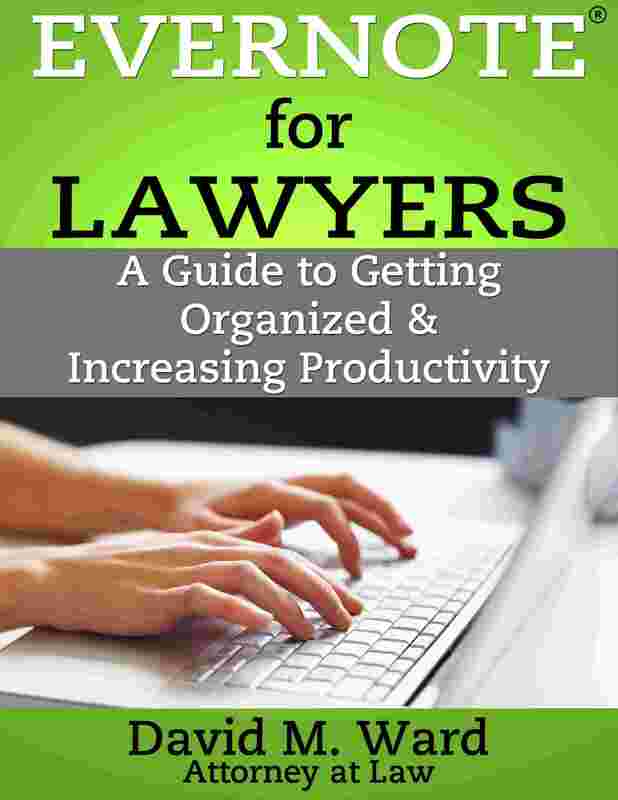 For many attorneys, Evernote has become the “go to” application of choice. Soon, most attorneys will be able to put their entire practice in their pocket, as some already do. But as you are about to learn, there’s so much more you can do in Evernote. In addition to managing documents and notes, I’ve found that Evernote is a great way to manage your tasks and projects. I use David Allen’s Getting Things Done® GTD® methodology (my version of it, anyway). I tried countless task management apps (desktop, web, mobile), searching for the perfect tool, but found myself spending too much time tinkering with the applications and not enough time getting things done. One day, I decided to see if I could use Evernote since I was already using it for notes. It isn’t a productivity application per se, but I was able to create a set-up that worked for me. Now, I am much more organized than I have ever been in my life and I am also much more productive. I’ll show you my complete task management system in Chapter 4. This book started as a series of blog posts about how I am using Evernote to get more organized and get more done. I got tremendous feedback on those posts and realized that many others are using Evernote not just for notes but as a tool for increasing productivity. It is to those of you who share my passion for Evernote and what it can do that this book is dedicated. Get Evernote here (it’s free).